Antec, Inc. is the global leader in high-performance computer components and accessories for the gaming, PC upgrade and Do-It-Yourself markets. Founded in 1986, Antec is recognized as a pioneer in the industry and has maintained its position as a worldwide market leader and international provider of quiet, efficient and innovative products. 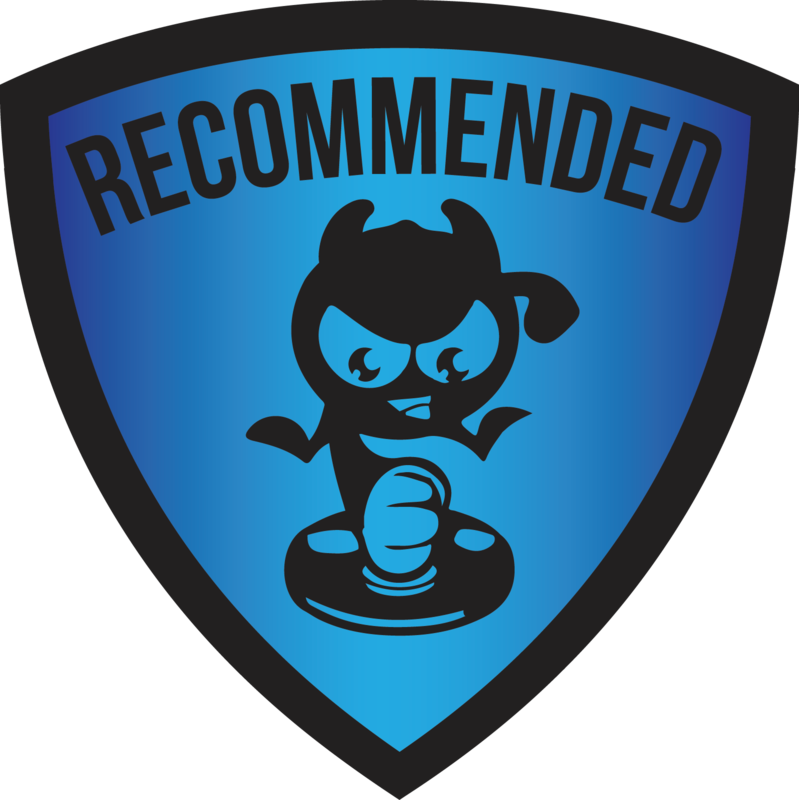 Their product lines include PC Chassis, CPU Cooler, PSU, Fans etc. Antec is headquartered in Fremont, California, with additional offices in Rotterdam, The Netherlands, as well as in the UK, Germany, France, Spain, Italy, China and Taiwan. The company’s products are sold in more than 40 countries throughout the world. Antec has sent me their 4 products for review purpose. Today, I will be looking at their entry level, budget PC chassis GX 200 Blue. 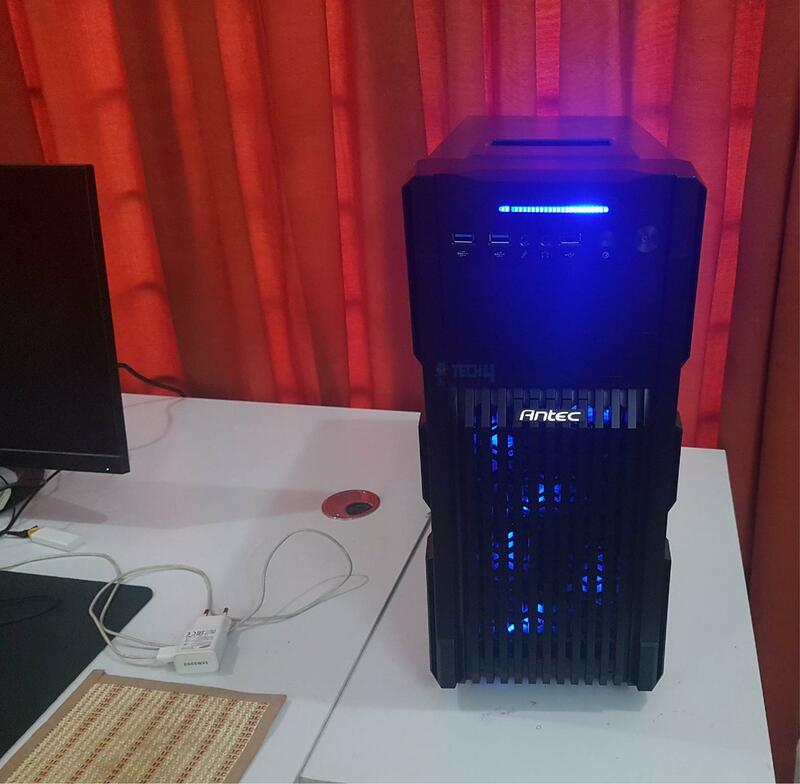 It is a compact mid tower with stylish front panel and two 120mm blue LED fans on the front. Build quality is solid. 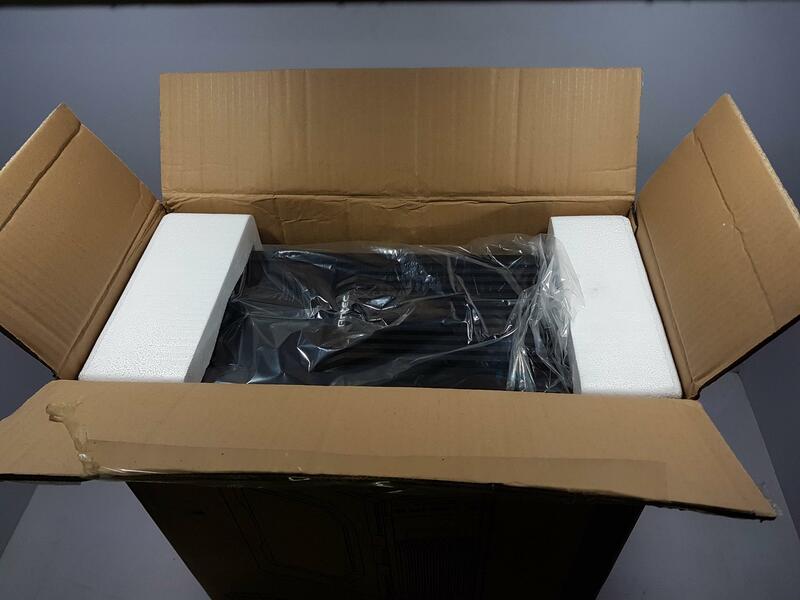 The chassis comes in a standard brown colored cardboard box packing. The front side has a picture of the chassis on the main section. GX200 is printed on the bottom left side. 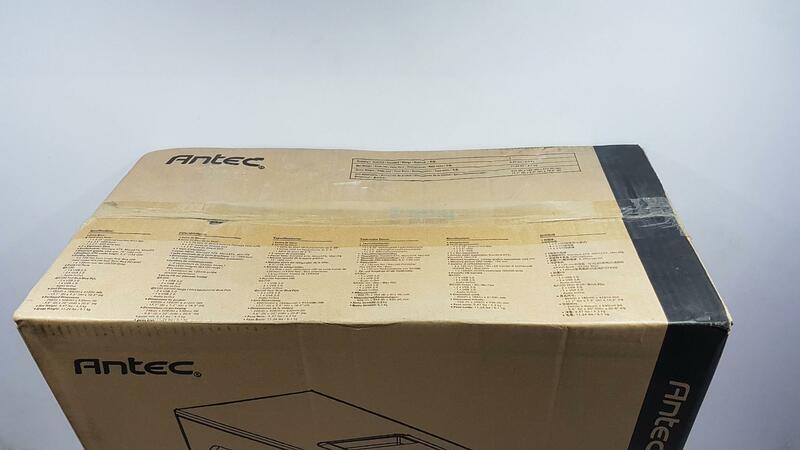 Antec brand logo is printed on the top left side. Antec is printed in the vertical layout on the far right side. The backside has the diagram of the chassis with components taken off showing its possible potential. It comes with a window and non-window panels in different models. Salient features are printed in 6 languages. 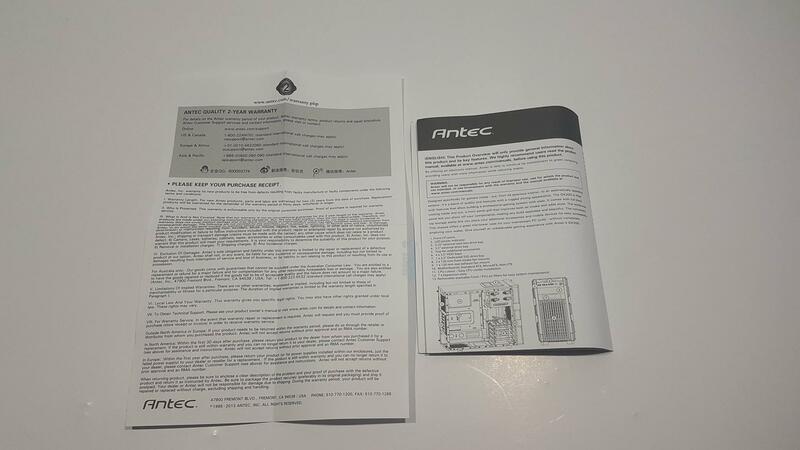 Antec is printed on the top left side and on the far left side in the vertical layout. The top side of the packing box has the specifications of the chassis printed in 6 different languages. 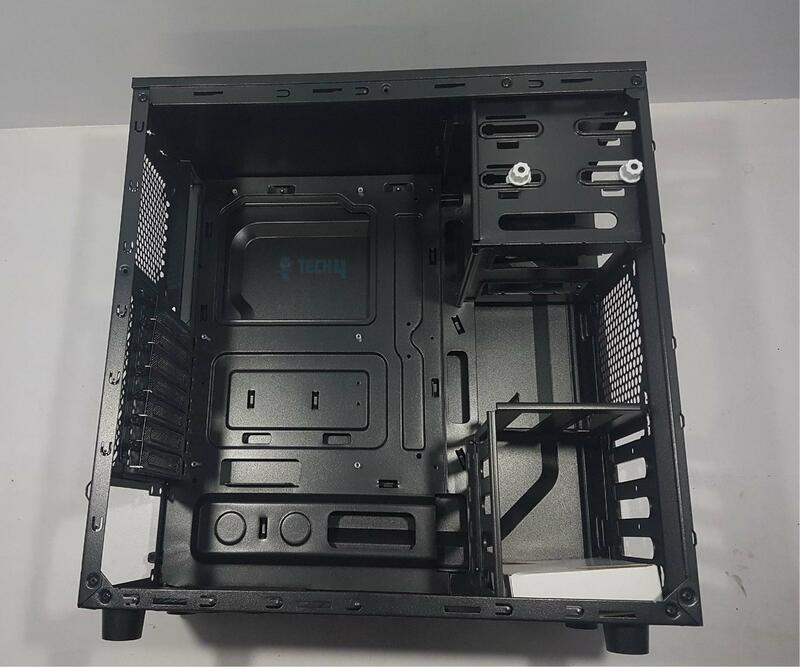 Antec is printed on the top left side. On the top right side info like weight, dimension etc is printed in a tabular manner. This side has the picture of the front side of the chassis printed in the main section. 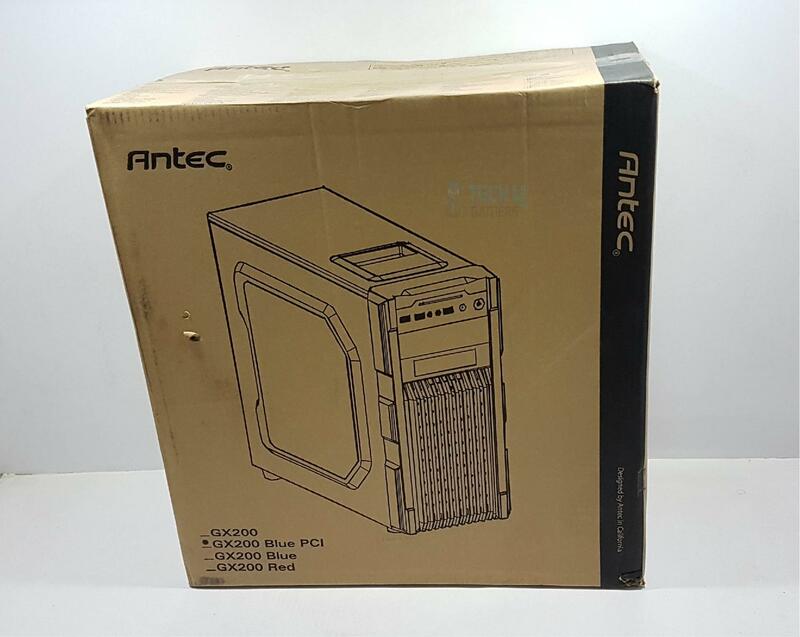 Antec is printed on the top left side. This side has the side view printed in the main section. 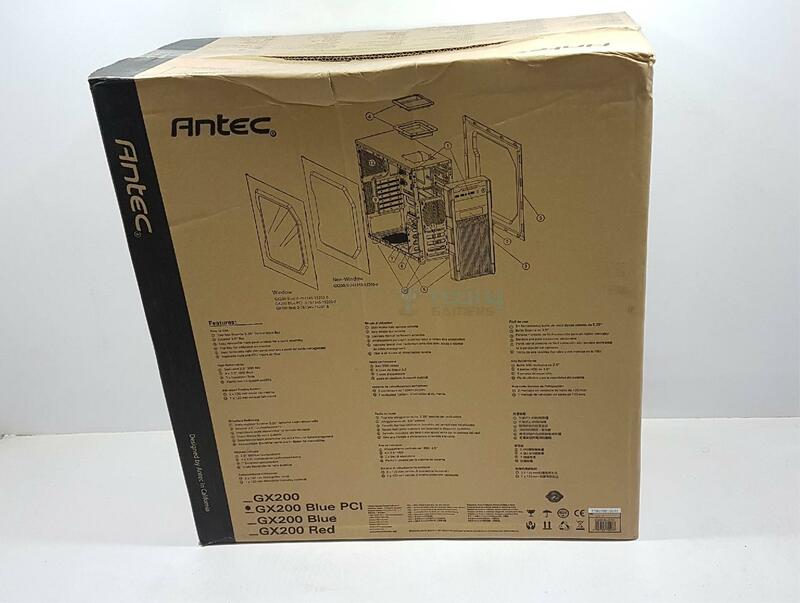 Antec is printed on the top left side. Model is GX200 Blue PCI. The chassis is covered in a plastic sheet and packed inside two white color Styrofoam paddings. Antec has included 5 cable wraps, various screws for mounting storage drives, fans, motherboard etc, and user guide. Whenever I hear about Antec, the first word that came to my mind is PSU. Strong brand perception speaking out here. 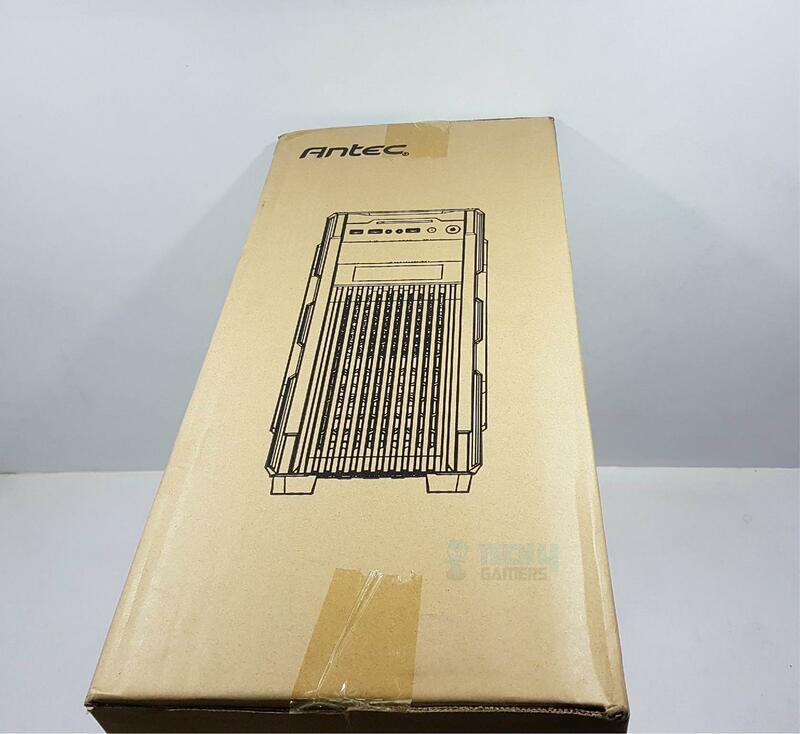 Though, Antec is not limited to PSUs only as mentioned in the introduction of this content. 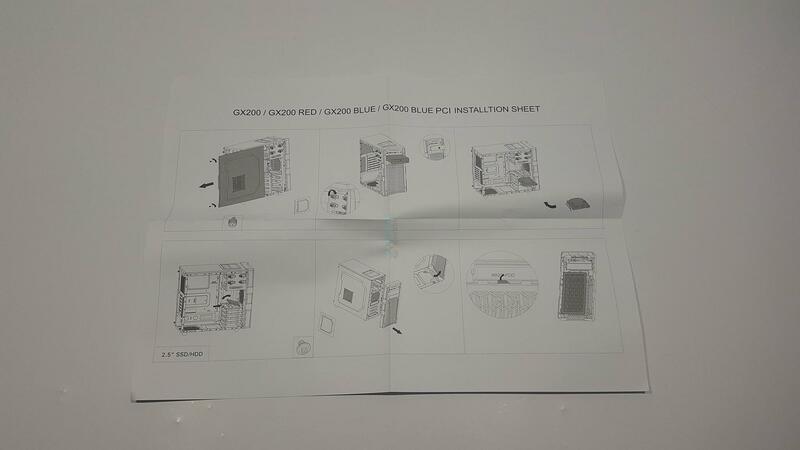 I get to review one of their chassis which is GX200 Blue. 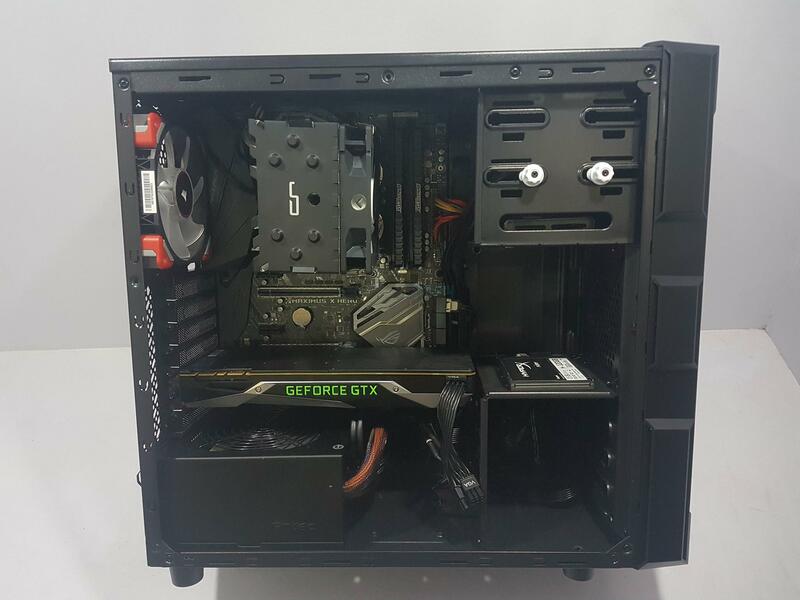 It is a compact mid-tower chassis with bold looks on the front and handy cooling provision. Chassis is made of Steel and plastic with solid build quality. Let’s take a closer look at the chassis. The front side of the chassis has a stylish panel made of plastic. On the top, there is a front I/O panel. It has 2x USB 3.0 ports, a USB 2.0 port, Headphone and Microphone ports, a reset button and a power button. On the far top, there are LED indicators that light up in the blue color only and add to the subtle looks of the chassis. Right below the I/O panel, there are 5.25” drive bay cover and a floppy disk drive bay cover, though later are long out of the action. 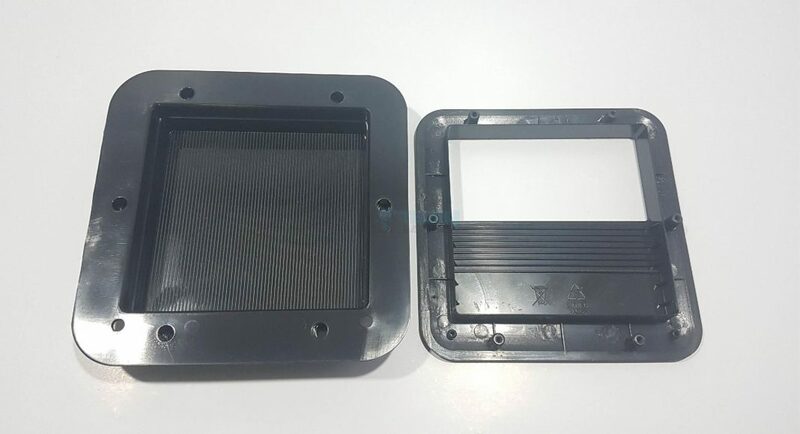 The covers can be removed from inside the panel for which it needs to be taken off. 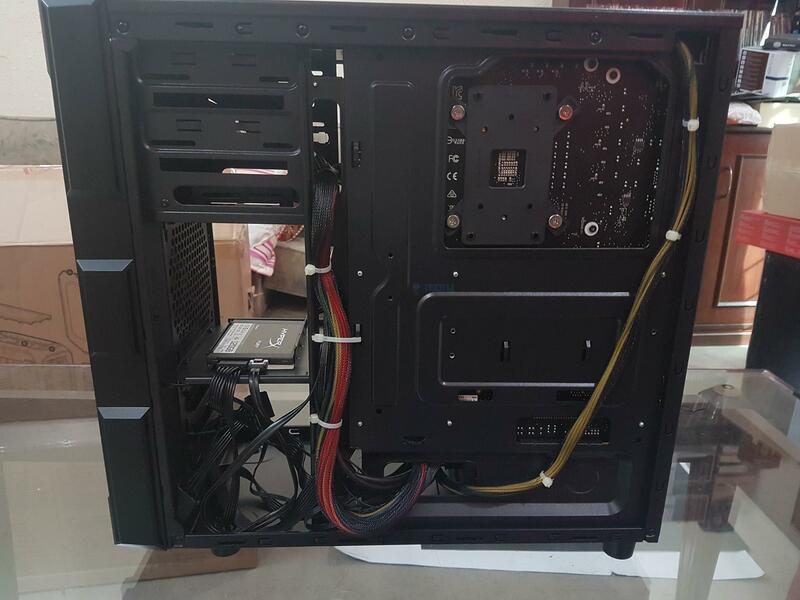 To remove the front panel, place your hand on the bottom side of the panel and pull it out. Be careful not to exert too much pressure as one of the cables on the front I/O panel is connected to the chassis. 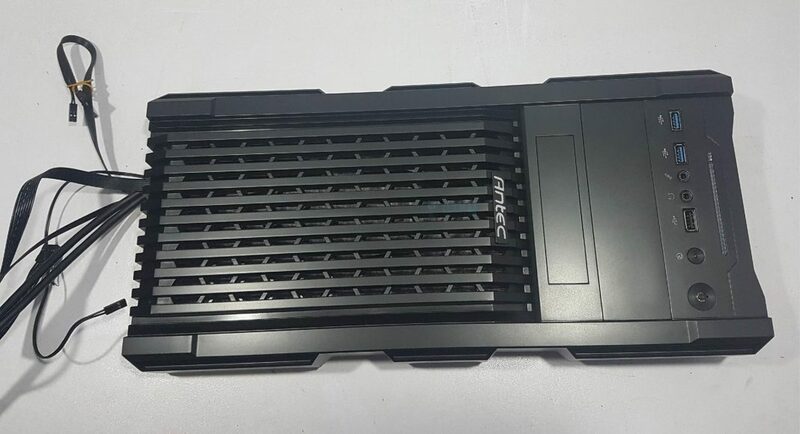 The lower portion has a raised surface with the Antec brand name pasted on. There are wide gaps on the raised surface almost giving an impression that lines with equal distance are going from upside down. This area has dust filter underside of it. It is well synchronized with the overall design of the front panel. Let’s take a look at the backside of the front panel. On the top, we can see the circuit of the I/O panel and the LEDs. Under it are the two removable bay covers. There are latches on both ends of these covers. Push them inwards and covers will pop out. Under these covers is a large size removable dust filter which can be washed to clean it. 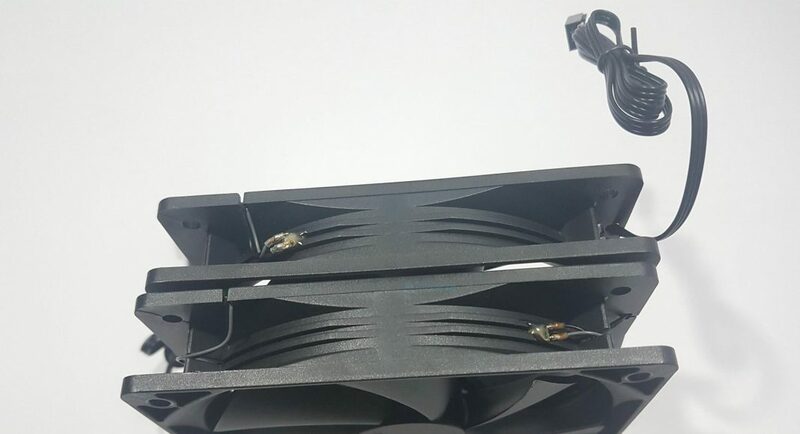 There are two 120mm fans on the front side of the chassis out of the box. 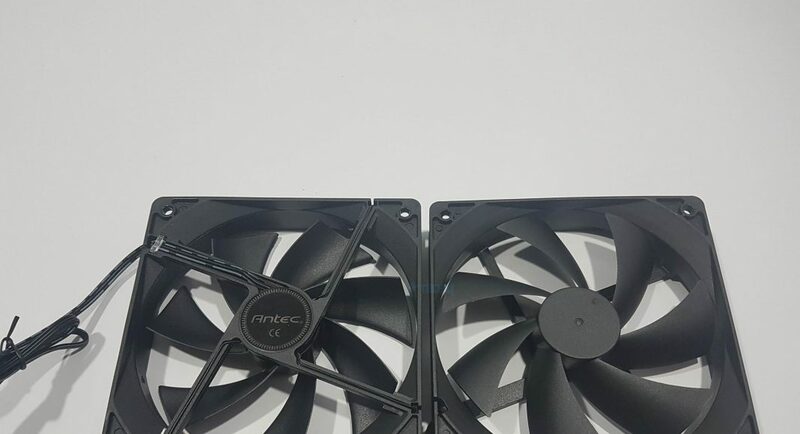 Antec was quite thoughtful by providing two fans where competition usually provides a single fan. 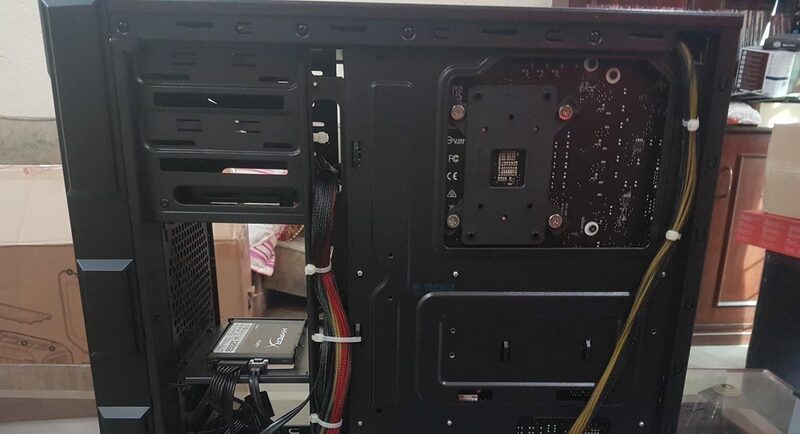 Remove the front panel to access the fans. 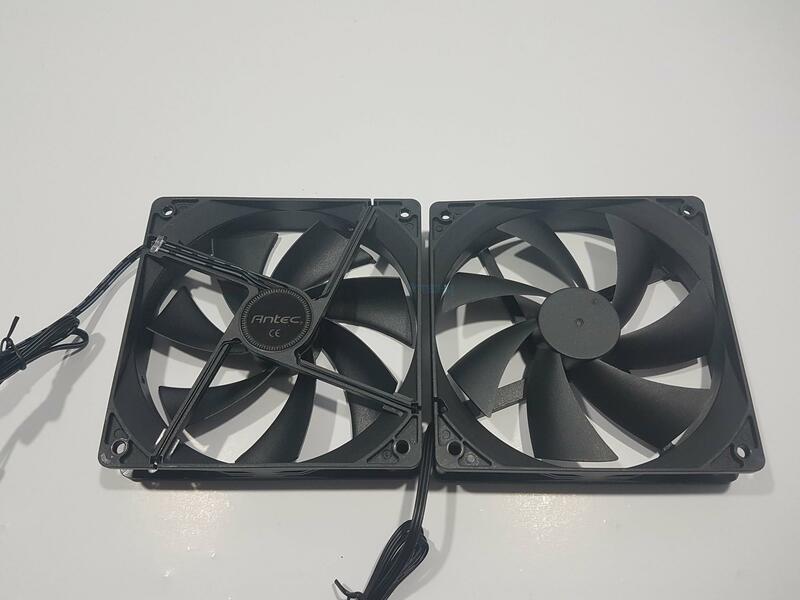 These are 120mm fans in total black color. The front side has no sticker on the motor hub. The backside has the sticker with Antec printed on it on the motor hub. 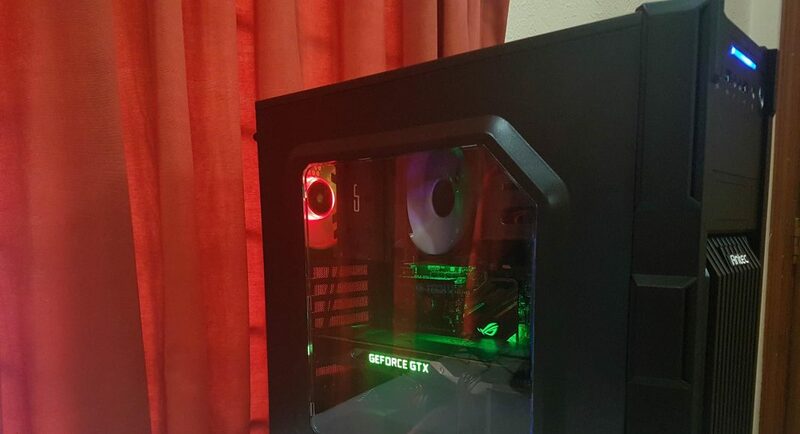 What is more pleasing about these fans is that they have the LEDs on three sides of their frames which light up in the blue color. 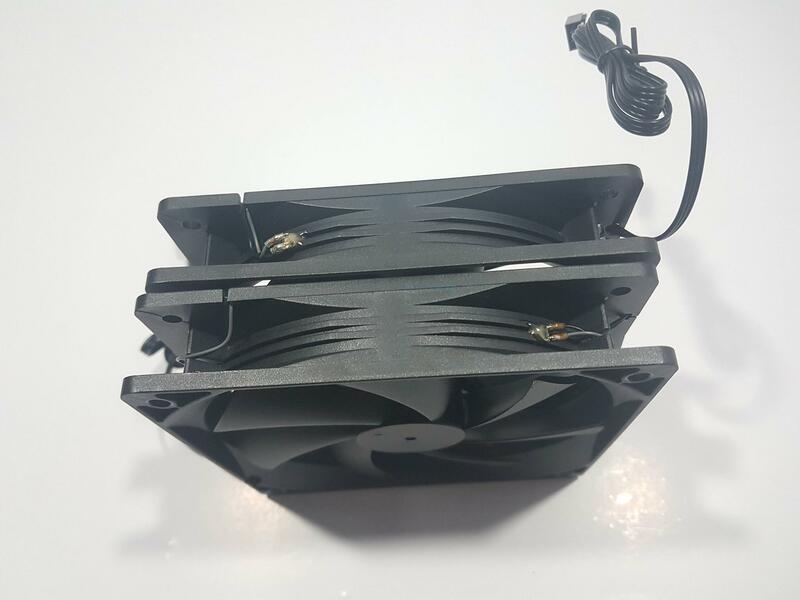 These are 3-pin fans. 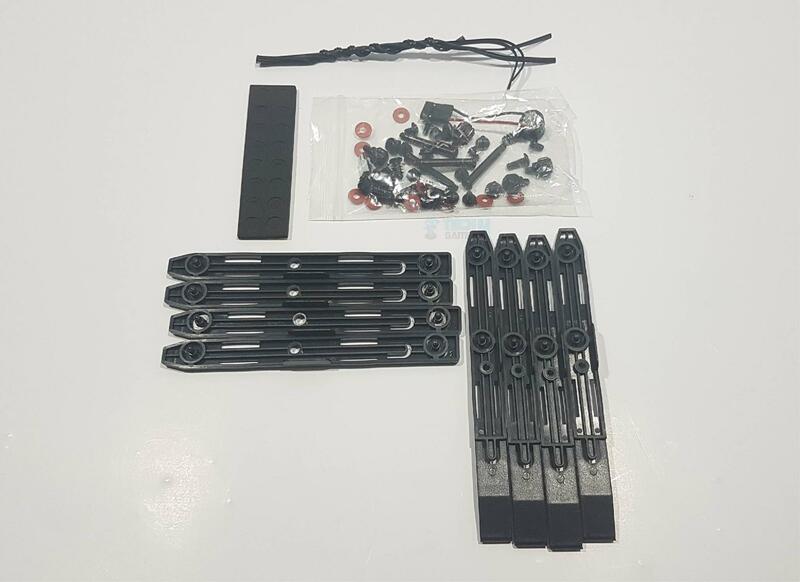 Each fan is secured using two longs screws only. Take these off and the fans can be removed. Now, we can take a look at the complete front side of the chassis with everything removed. Take a note on the underside area where the fans are mounted. 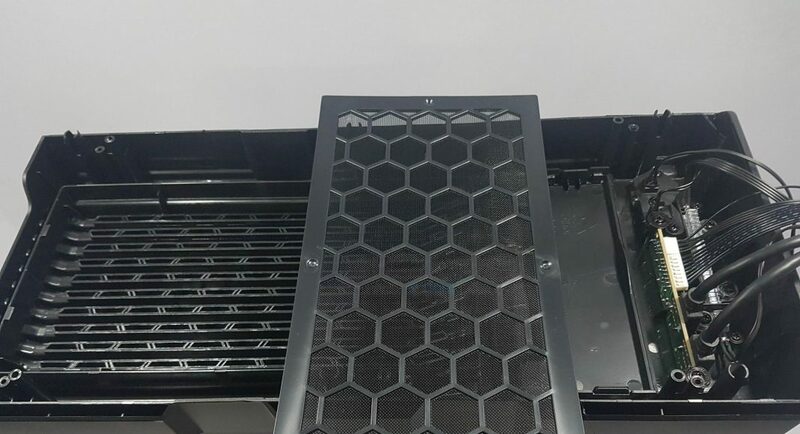 The area under the top fan has mesh style whereas the area under the bottom fan has vents and is facing the HDD cage area. 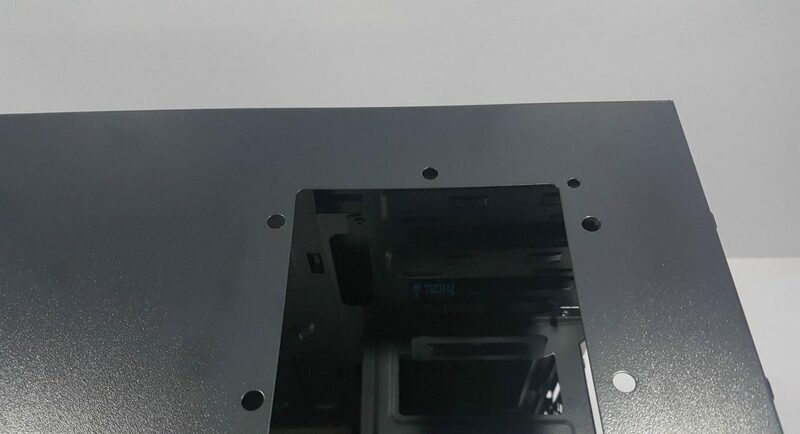 We can see the floppy disk mounting area and the 5.25” bay. The 5.25” bay drive mount is tool-less. 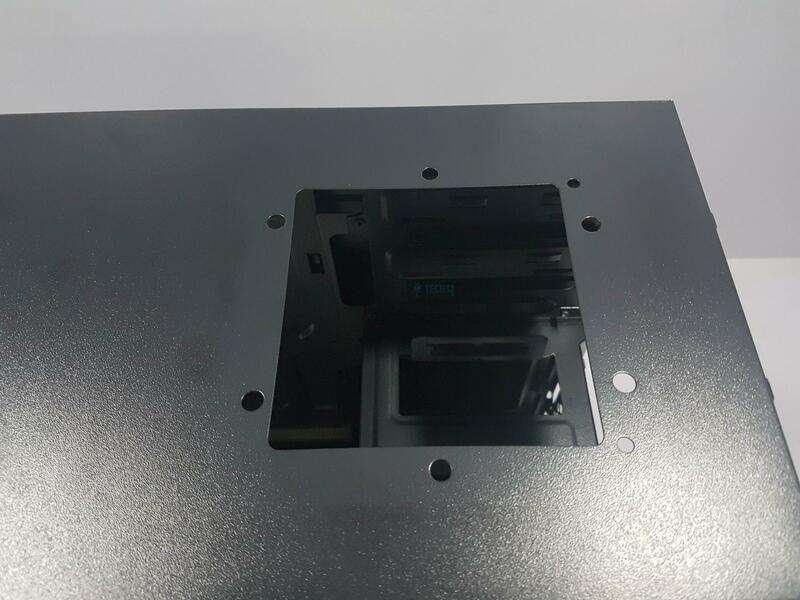 There are two buttons on the left side of the bay which can be pressed inside and slid for easy mounting of the 5.25” drive without any hassle or need of screws. 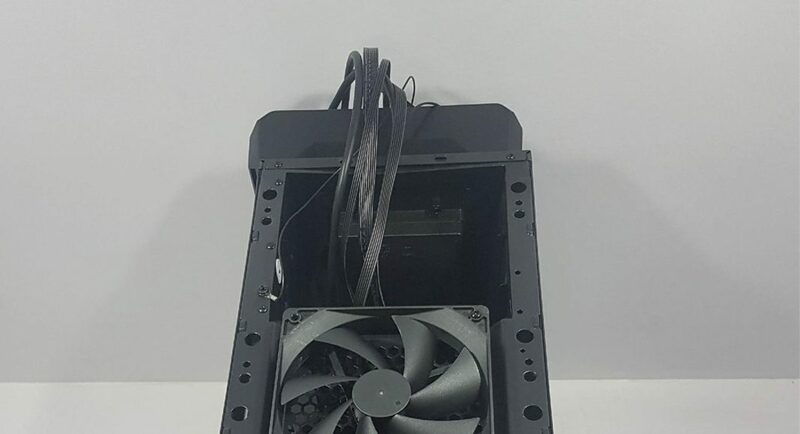 The top side is flat and does not have any fan mount or vent for airflow. On the front side, it has a stylish container which can be used to place accessories etc. It almost resembles the ashtray though it isn’t and don’t take my words to use it for the ashtray. It is comprised of two parts stacked on each other. The entire body is secured to the chassis using 6 screws with two on the front facing and the backside while one on the left side and the other on the right side. Take these screws off the remove the entire container. 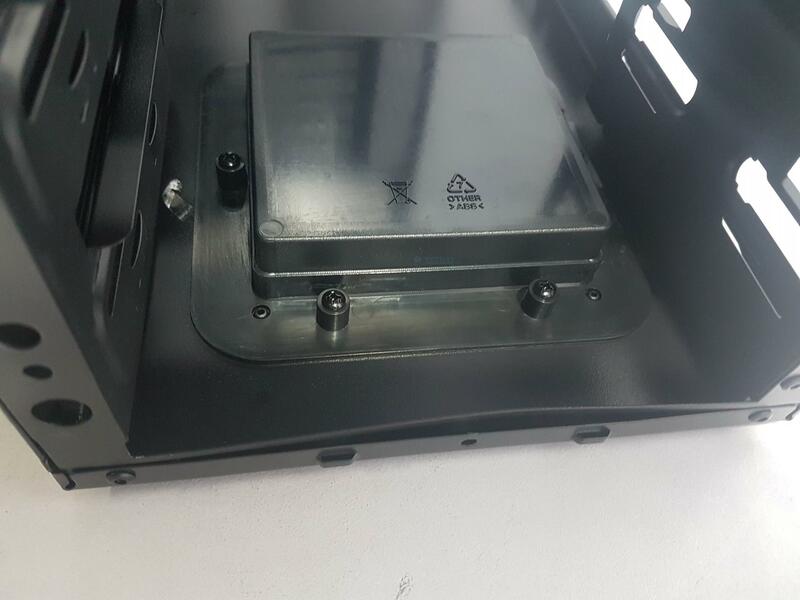 The bottom side has 4 plastic feet raising the height of the chassis by 10mm or so hence giving enough clearance for the PSU to draw fresh air from the bottom. 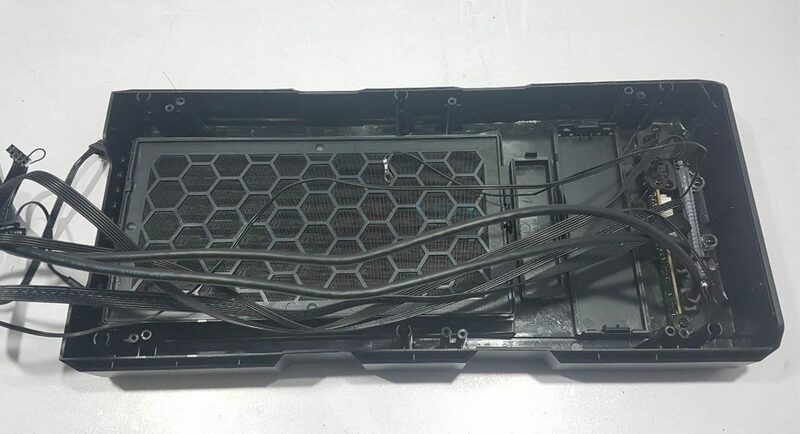 The PSU mount area has mesh design and is covered with the removable dust filter. The rear side of the chassis has two holes with rubber grommets on the top right side. 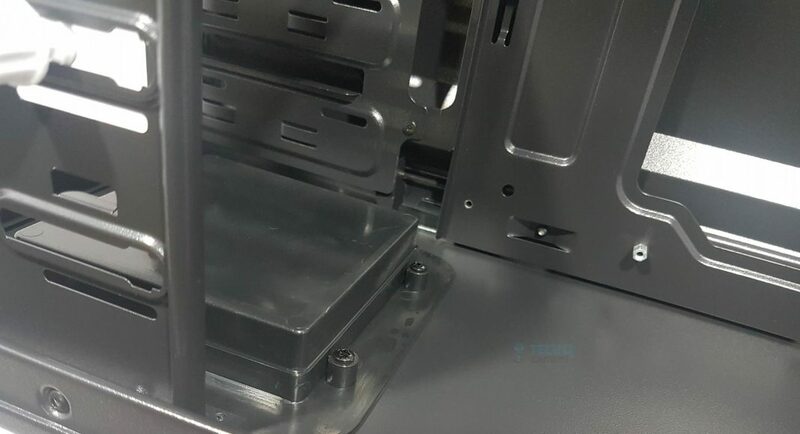 As the chassis does not support any liquid cooling solution, these two holes can be used to route the hoses through them for external radiator mounting. Right below them is a meshed area for mounting of the 120mm fan. There is a back I/O panel area on the left side of the fan mount. The chassis has 7 PCIe slots. There is a vented area on the right side of the PCIe slots for air flow. 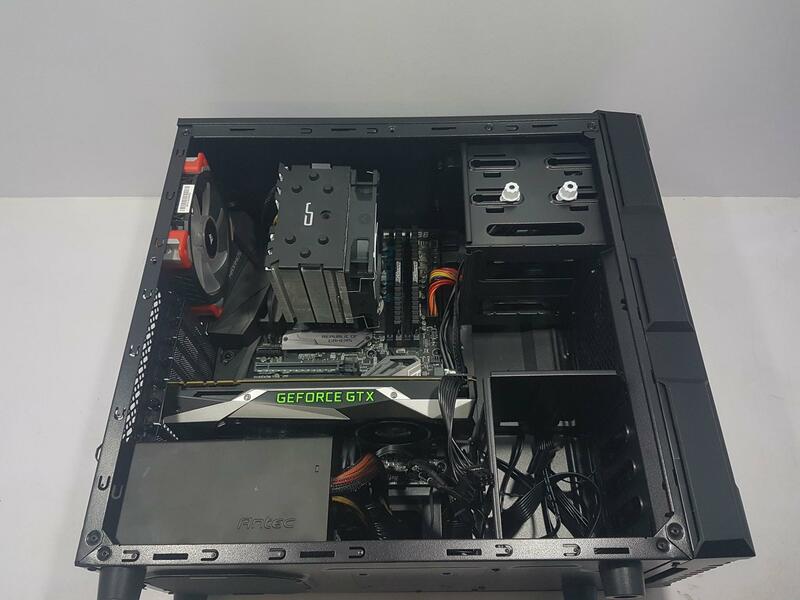 The bottom has a mounting area for standard ATX PSU. Both side panels are secured using thumb screws. The left side of the chassis has a window side panel. 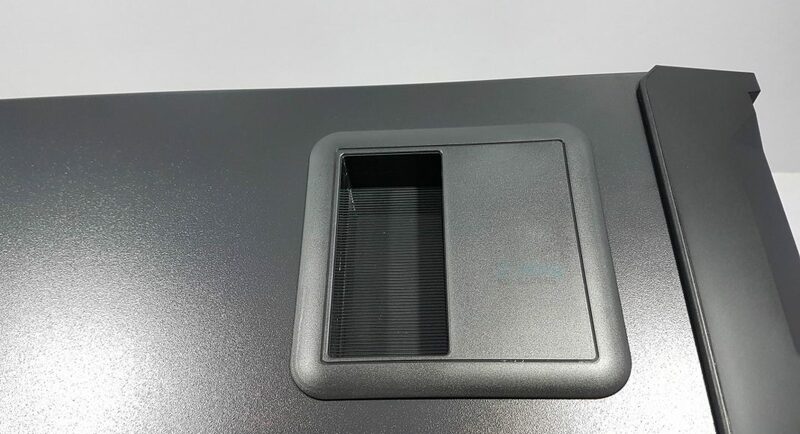 The panel has a see-through window with the window area being raised outside making an inset in the middle of the panel. This gives few extra millimeters to the CPU cooler. 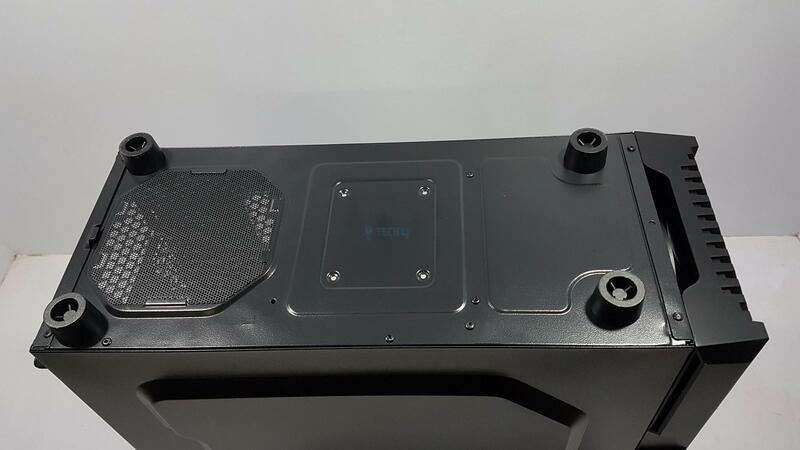 The CPU cooler up to the height of 158mm can be mounted inside this chassis. The side panel a bit of a flex to it. 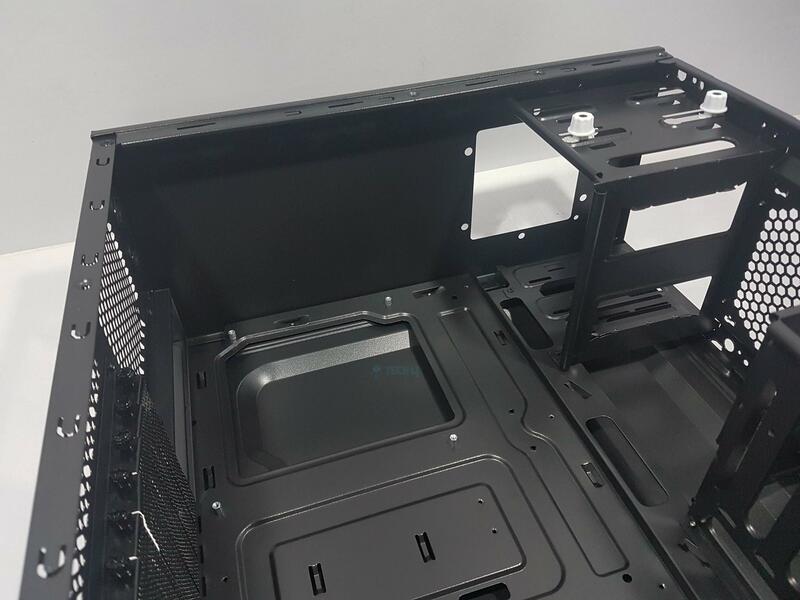 Let’s take a look at inside the chassis and see what it offers to the builder. 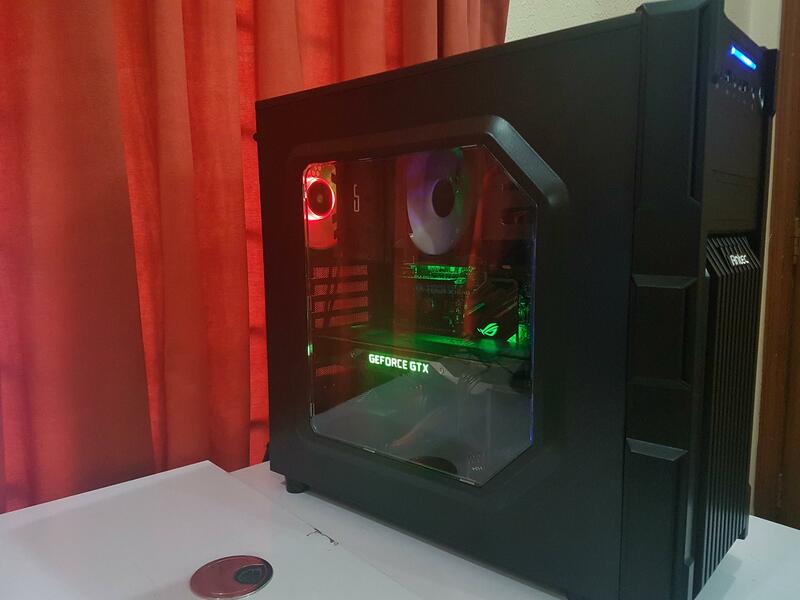 It is a compact mid-tower. On the top side, we have a cutout on the top left side. This is where the CPU cable is to be routed. Take note to route the cable before installing the motherboard. 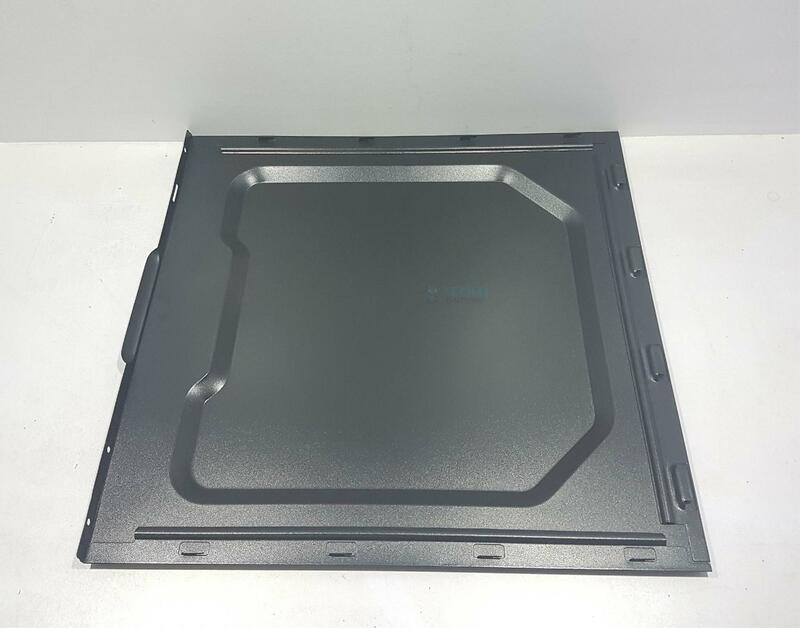 There is a large CPU cutout in the middle of the motherboard tray on the top section. Motherboards up to standard ATX form factor can be installed inside this chassis. Take a note that only 6 standoffs which are in silver color, are pre-installed. 3 are provided in the accessories and can be mounted. On the top left side of the motherboard tray is a 120mm fan mount. 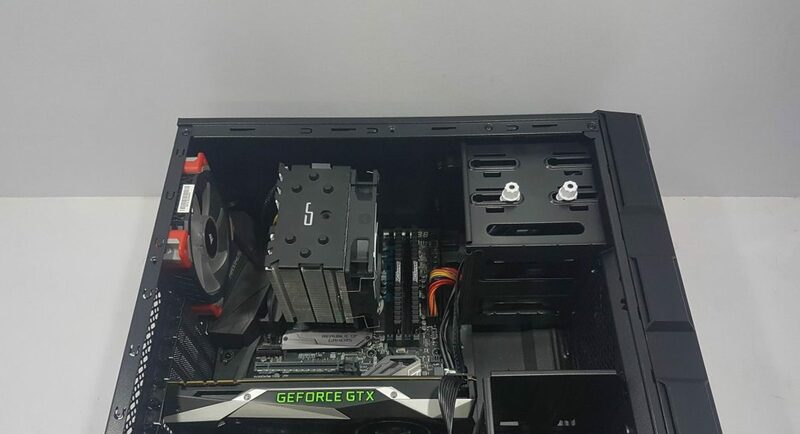 There is not vent or fan mount on the top side. There are 7 PCIe slot covers under the 120mm fan mount. 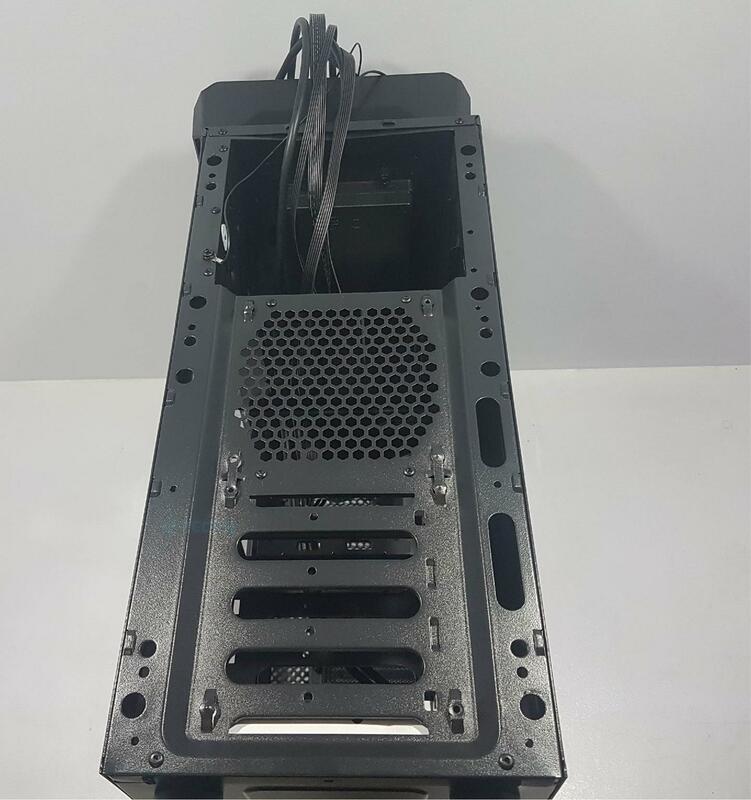 The bottom has mount for the PSU.PSUs up to 162mm can be easily installed inside this chassis with enough room for the cable management. 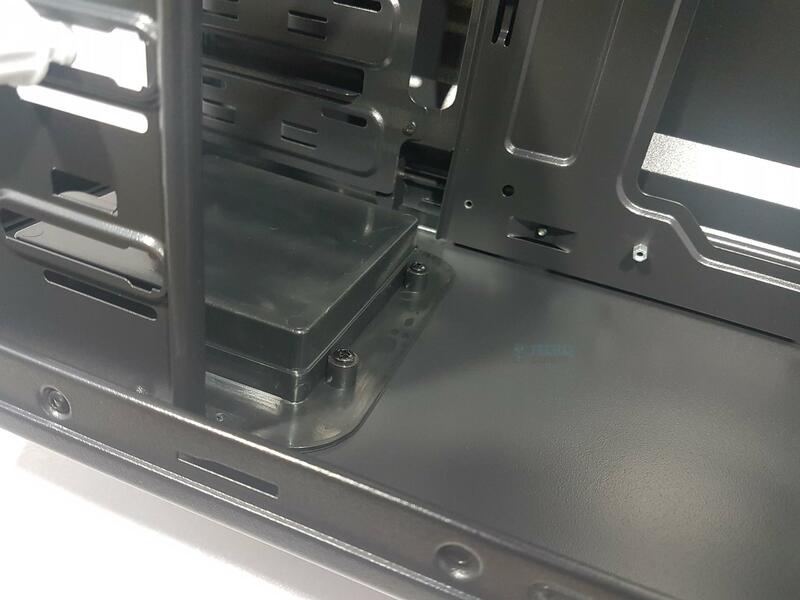 There is a SSD mounting provision right next to the PSU mount which is optional. There are 4 cutouts on the right side of the motherboard tray without any grommets. These are for cable routing for the connectivity. On the bottom right side we have a storage drive cage without any caddy. 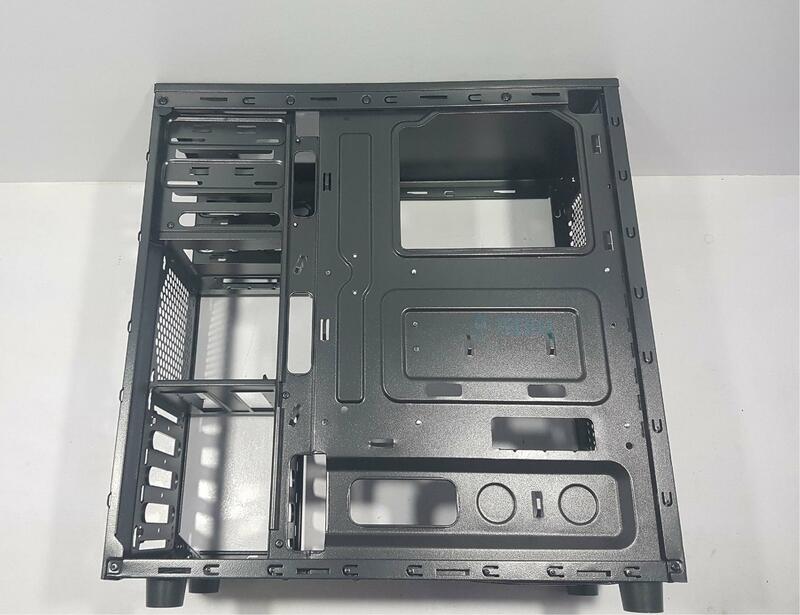 Antec has provided side rails which can be mounted on the HDD and then slided inside the cage. As simple as it can get. This also helps in air flow by not covering the unused space inside the cage. The top cage is for the 5.25” and floppy drives. Note the white color rounded buttons which are there to make the installation of the 5.25” drive a tool-less one. 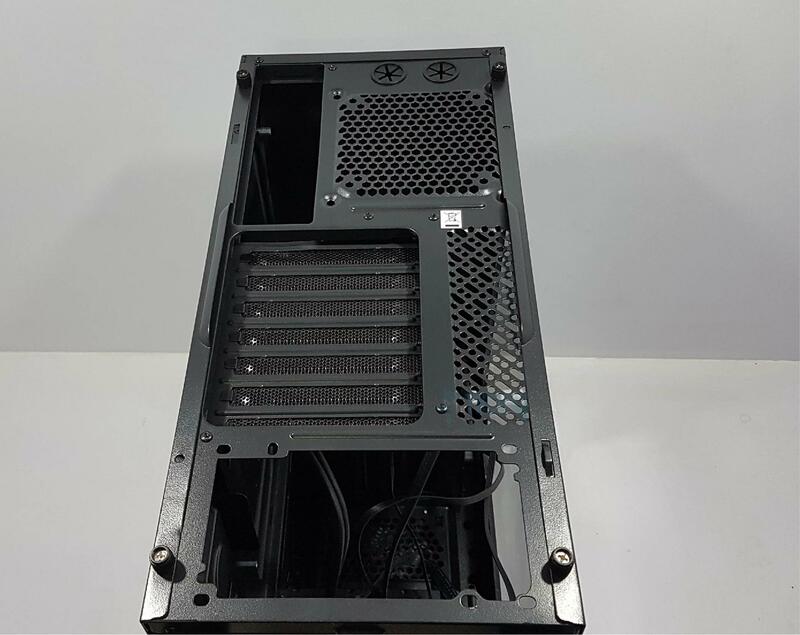 Graphics card of length up to 380mm can be installed inside the chassis. Let’s take a look at the backside of the chassis. We have a similar side panel though it does not have a window as is on the left side panel. 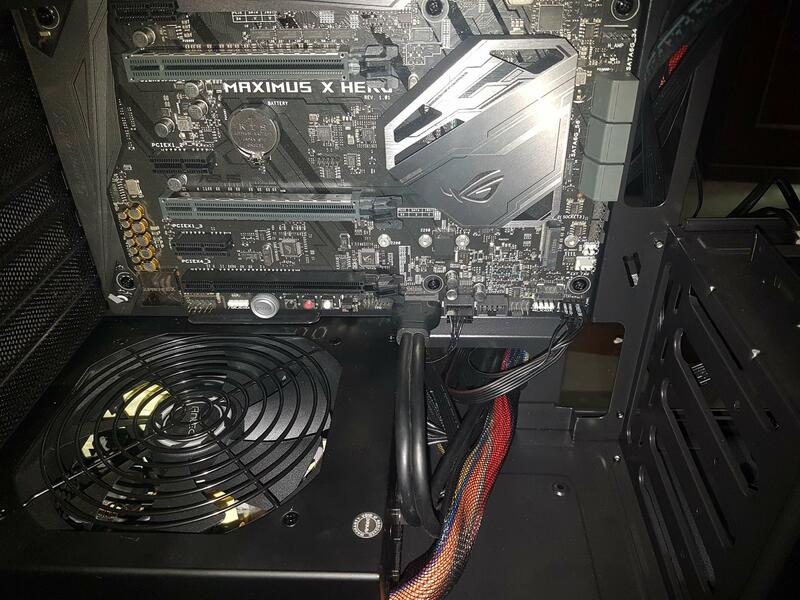 There is inset of approximately 10mm in the side panel to make more room for the cable management as there is no such provision right behind the motherboard tray. 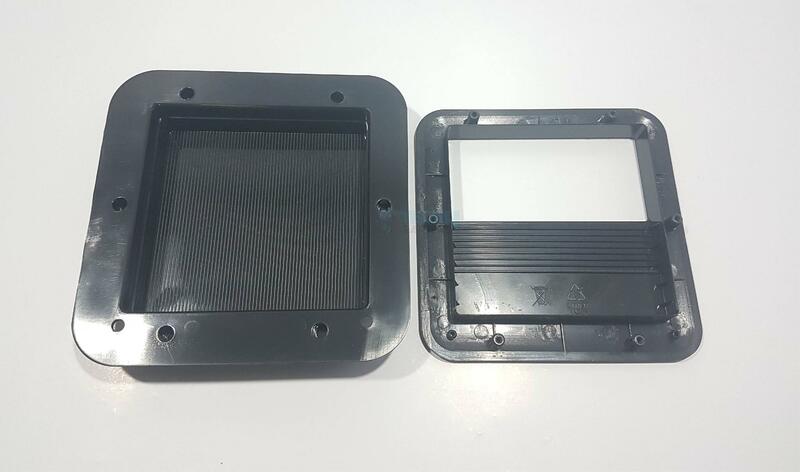 Opening and closing mechanism of this side panel are same as on the left side. Starting from the left side, on top we have the left sides of the 5.25” drive bay and the floppy bay. Under that there is a open area and on the bottom we have the open area inside the storage drives cage. In the middle we can see 4 cutouts for cable routing. The bottom cutout is wider. On the top right side we can spot another cutout for routing the CPU power cable. 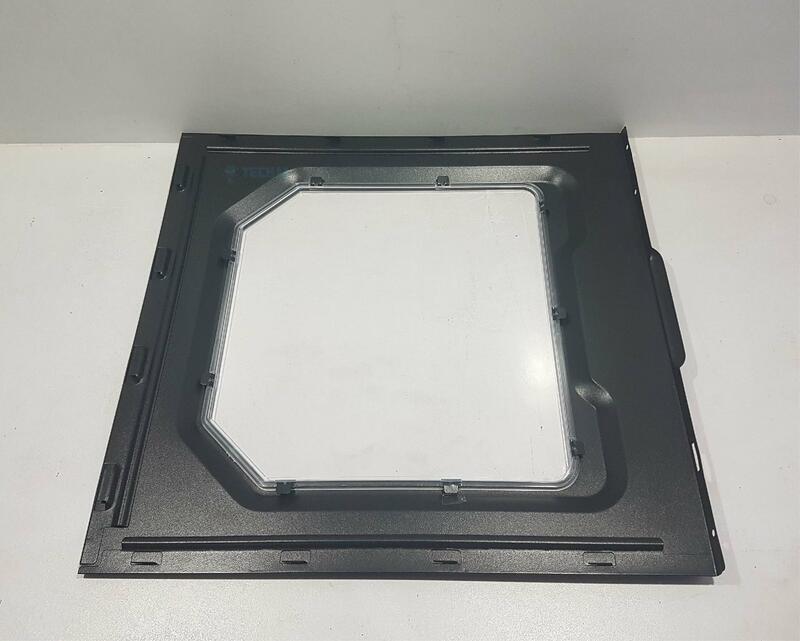 Under it is a large size CPU cutout area which helps in the installation of the CPU cooler. The bottom side has an inset where the PSU is mounted on the opposite side. There are 8 cable tie areas. Route the CPU power cable from the top right cutout above the motherboard tray before installing the motherboard. Once the motherboard is installed, there won’t be a possibility to route this cable through that hole. Route the front I/O panel’s cables from the top cutout. I routed them through the second cutout only to realize afterwards that routing them through the top cutout would be helpful in cable management. Overall, the building experience was good and I did not encounter any issue other than the observations mentioned above. The chassis front I/O panel cables were routed through the same cut out from where the PSU cables are going out. All the connectivity was done at the bottom of the motherboard. The Corsair ML Pro 120 Red was available with me at the time of building hence used it on the rear. Here are the pictures of the build. 76°C was the maximum temperature on any core. My chip is doing 4.8GHz out of the box on Auto and in doing so the voltages are spiking to 1.300V VCore. Temps are fine overall. 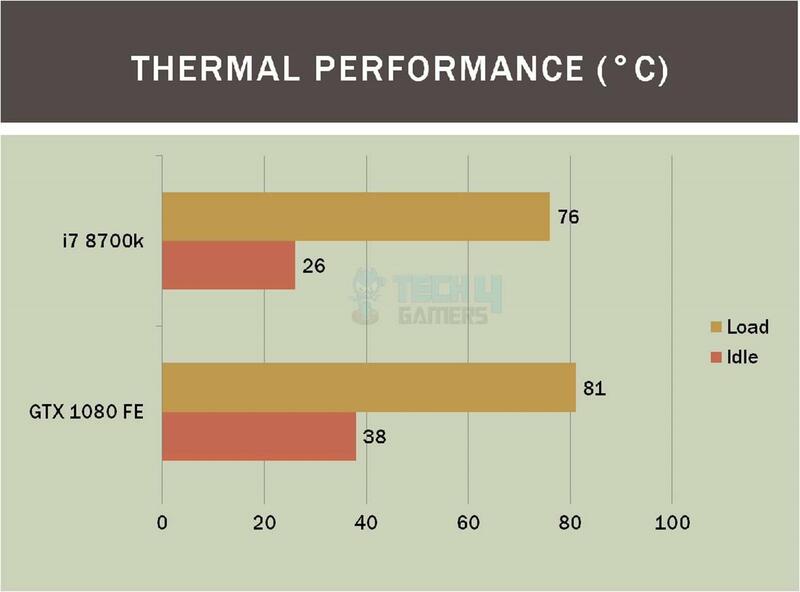 Maximum temperature on the GTX 1080 FE was 81°C which is expected for being a reference edition design. 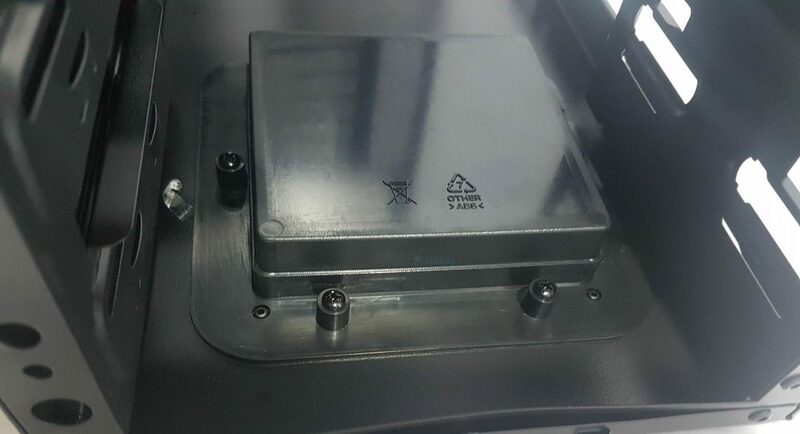 It is easily reaching 80°C in an open bench setup so inside the chassis it has done well. 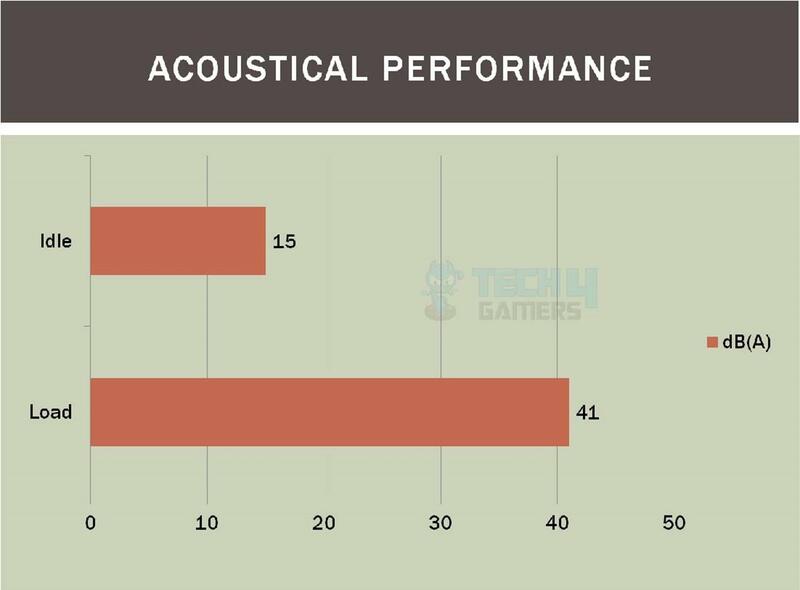 System was left at idle for some time to measure the acoustical performance. Keep in mind that this is the system’s overall noise level not just for any fan. 15 dB(A) was sound level when it was idling and 41 dB(A) when under load. 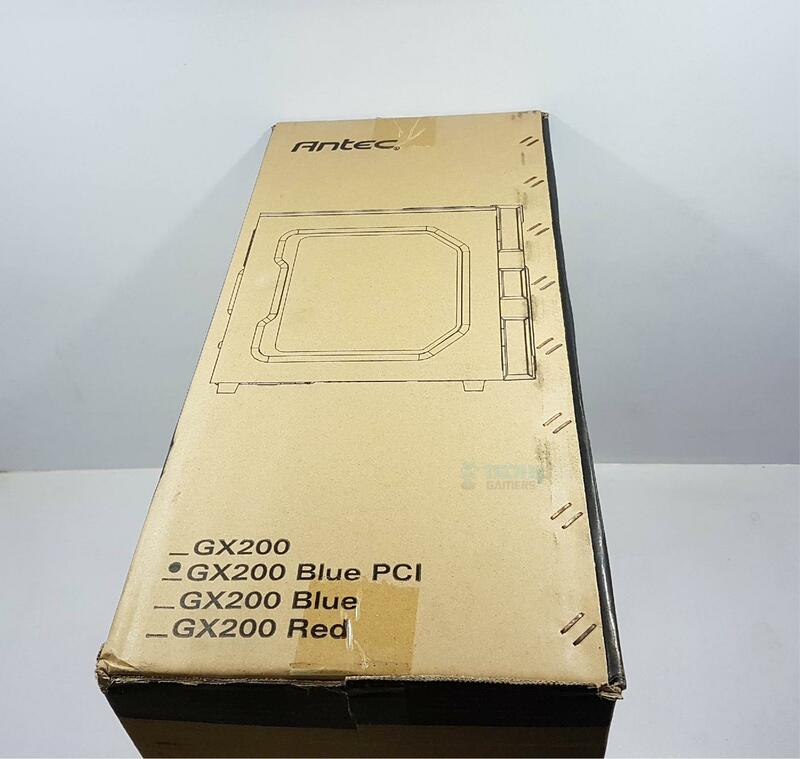 The Antec GX200 Blue is a chassis outfitted for the budget gamer who likes performance and style in the budget. The chassis has bold looks on the front and has well all round features to stir the competition in this range. 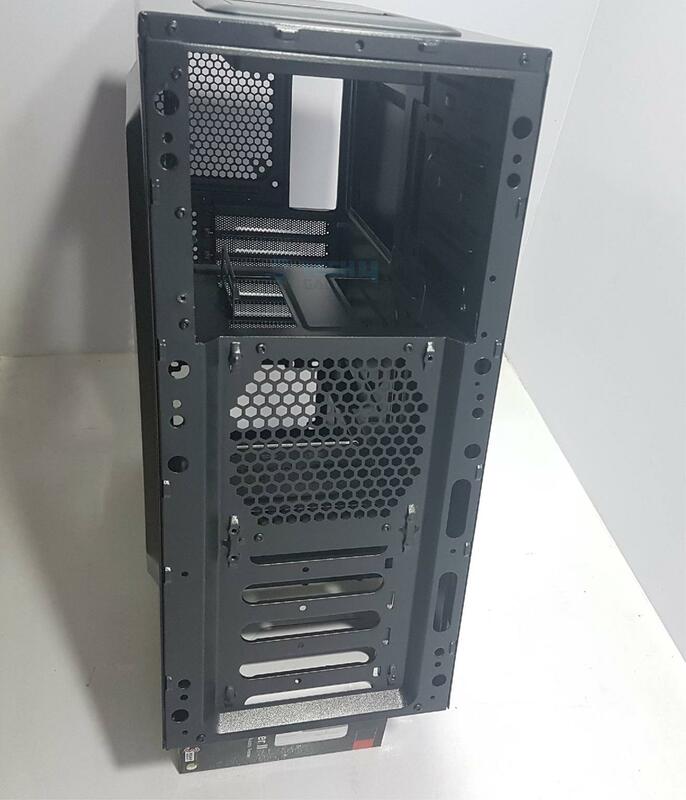 It is a compact mid-tower chassis with the dimensions of 450mm x 185mm x 412mm. It has a window side panel which. 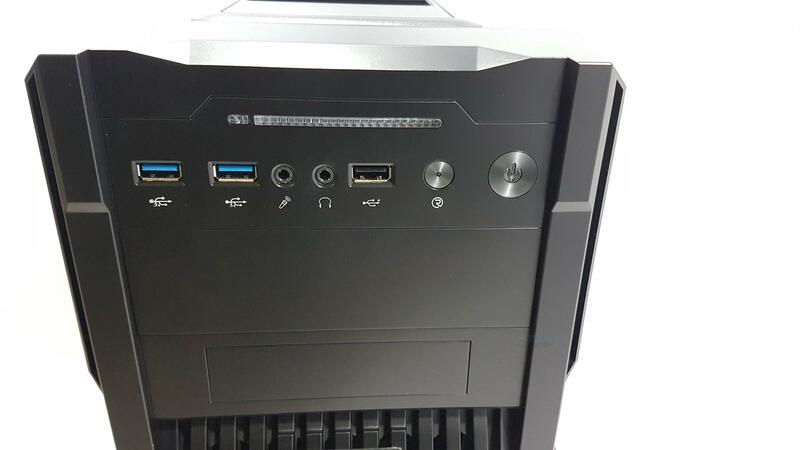 It has 7 PCIe slots. It has up to 4 3.5” storage drive mounts, 1x tool-less 5.25” drive bay and 2x 2.5” SSD mounting. 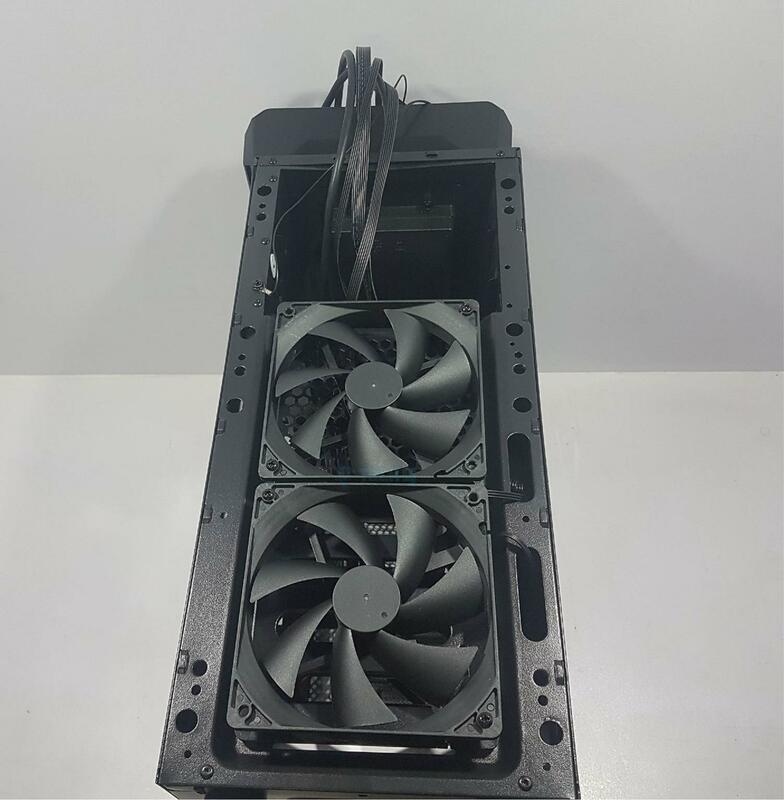 It comes pre-installed with the two 120mm Blue LED fans on the front. 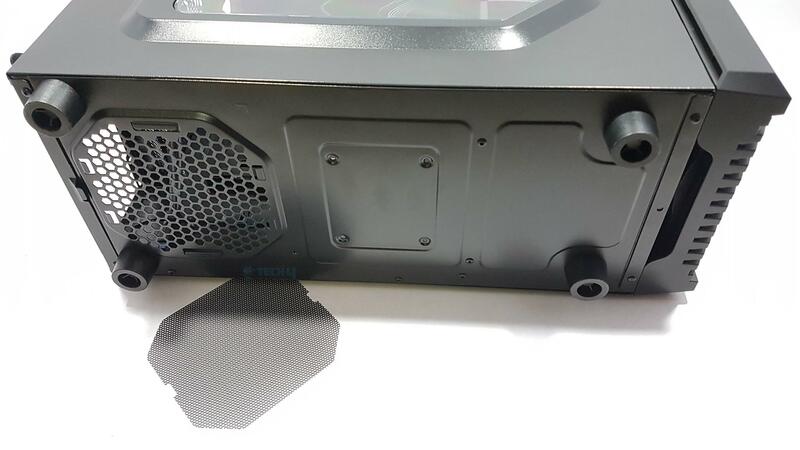 There is a removable and washable dust filter on the front panel. The front I/O panel is sleek and good looking. We have 2x USB 3.0 ports and a USB 2.0 port in addition to the audio jacks. There are stylish rounded power and reset buttons which feel really good on touching. There is a large size LED indicator on the top of this panel which lights up in the blue color. 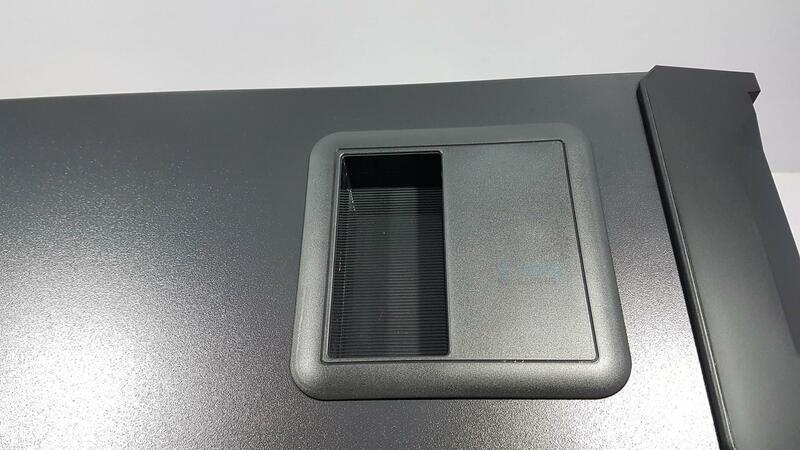 The bottom side dust cover can be removed for cleaning and it is not magnetic. 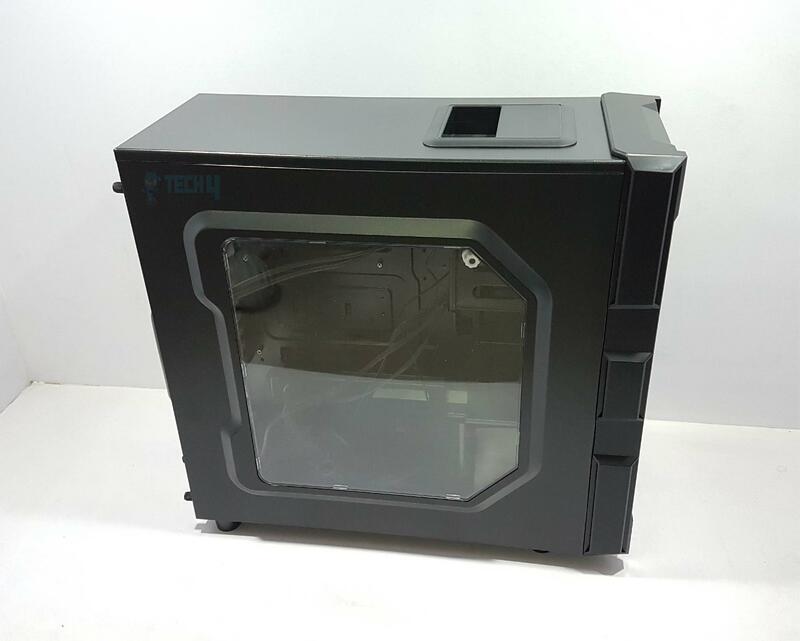 The chassis has support for Standard ATX, microATX and mini-ITX form factor motherboards. 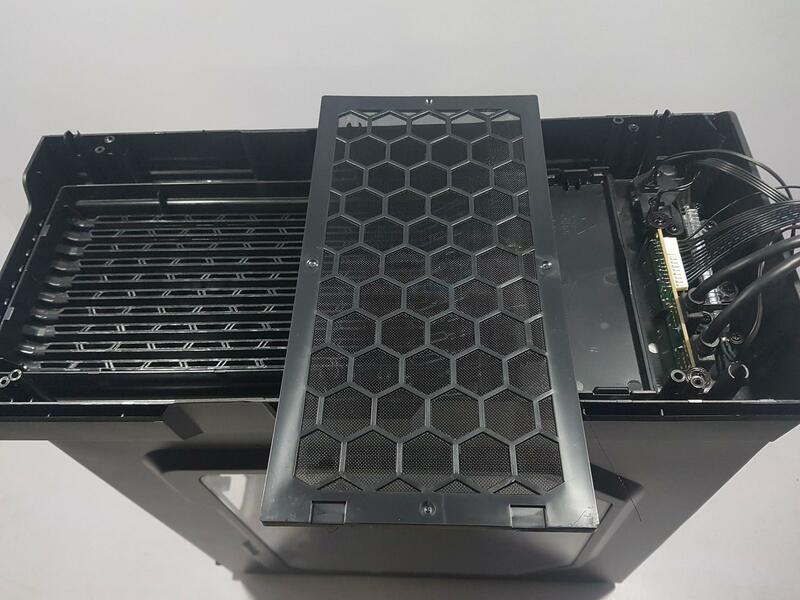 Graphics cards of up to 380mm length can be installed in the chassis. The CPU Cooler height clearance is up to 158mm. PSUs up to the length of 160mm can be installed. The storage drive cage is fixed but it does not have caddies. 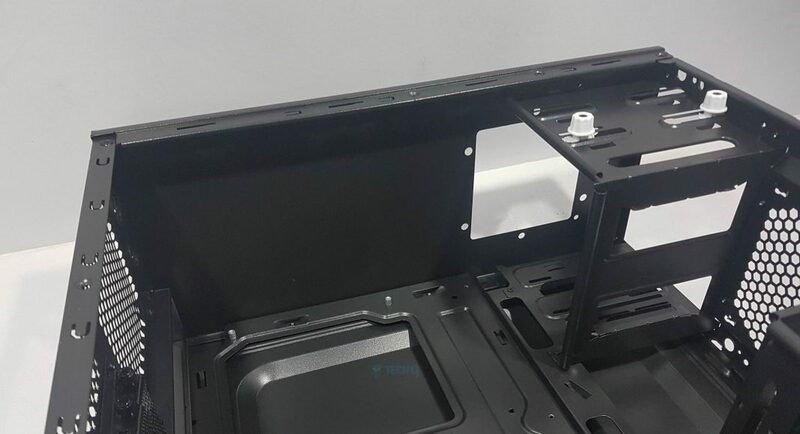 Antec has provided rails which can be mounted on the storage drives and slided inside the storage cage. This is a handy approach as it would help in the better airflow from the bottom side buy not covering the unused space. In terms of the cooling provision, the Antec has provided two 120mm blue LED fans pre-installed on the front side. There is a fan mount for 120mm on the rear. There is no fan mount on the top side or any vent for air flow. There is a stylish accessory container on the top side. Don’t take it as a handle to carry the chassis around. 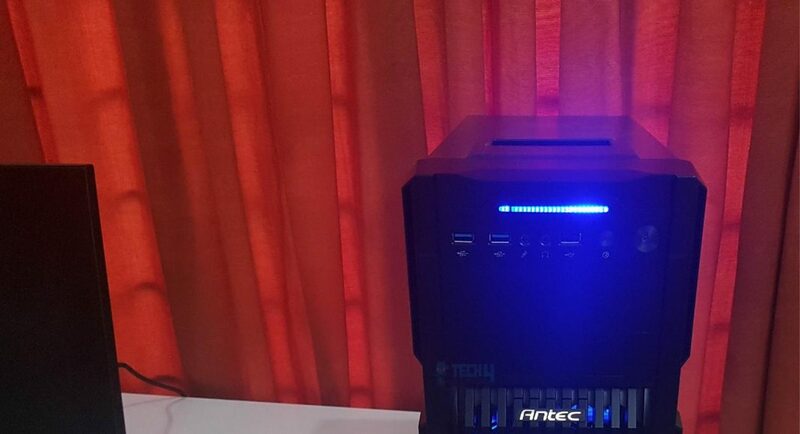 The Antec GX330 is listed at PKR 4999/- at the time of the review. Competition is stiff in this price segment. 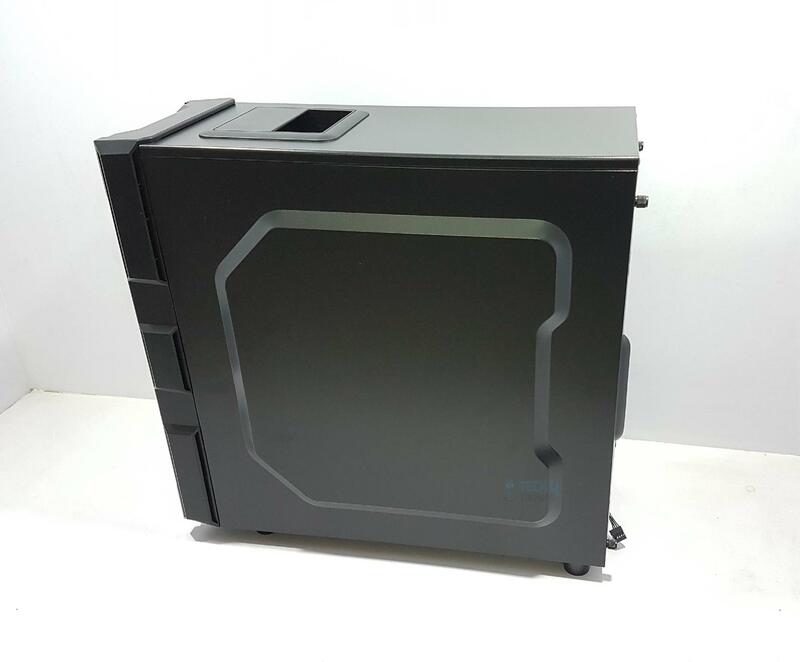 This is my second time with the Antec chassis and I am impressed that Antec has not compromised on the build quality even this entry level budget chassis. It comes with 2 years warranty. 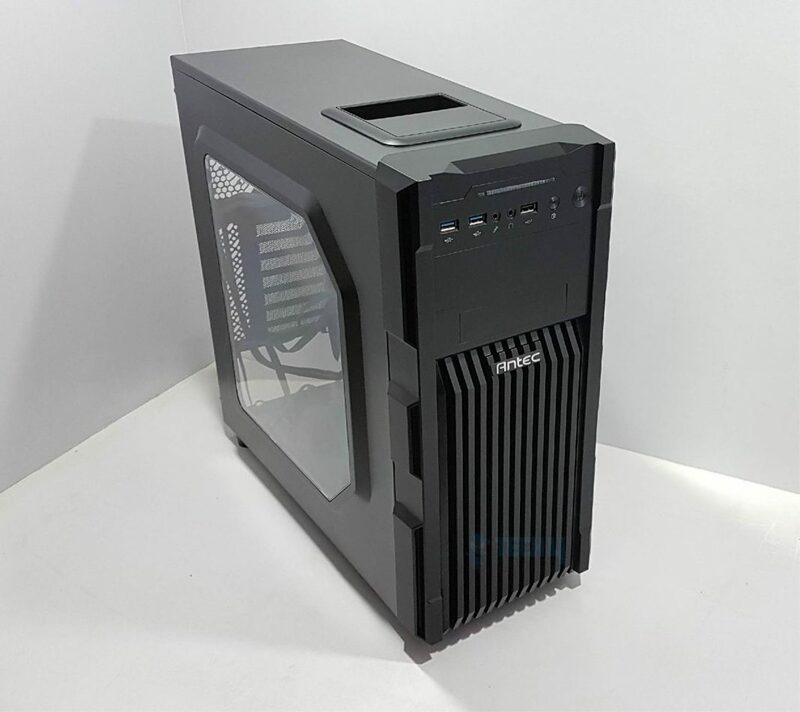 Antec GX200 is a stylish, featured pack entry level, budget friendly chassis which has well all round design. 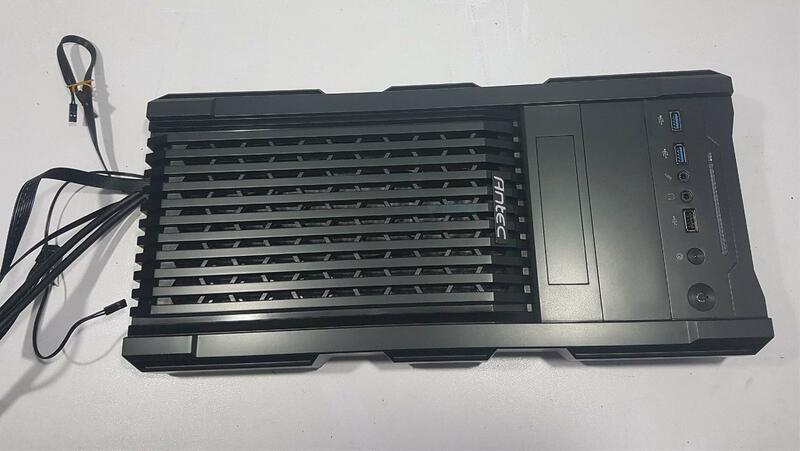 It comes with two pre-installed 120mm Blue LED fans on the front and LED lighting indicator on the front cover to add to the looks. 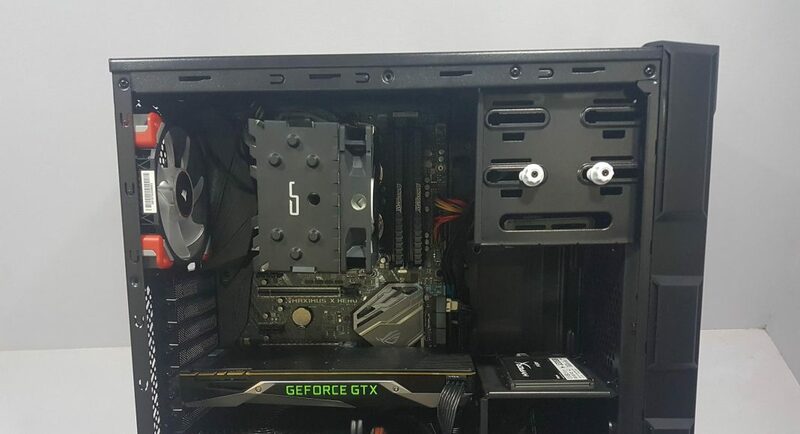 It has a window side panel. 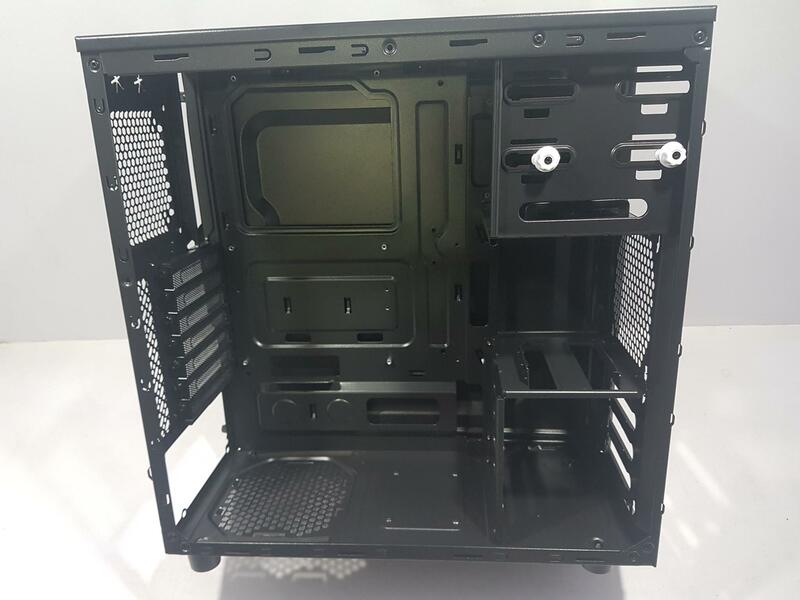 With 7 PCIe slots, up to 6 storage drive mounts, a tool-less 5.25” OD bay and 3 fan mounts this chassis has everything to drive budget user’s daily needs.